Now you can stay in sync when you’re on-the-go with Mobile Sync for Rackspace Webmail. Built on Microsoft ActiveSync technology, the mobile sync service syncs your Email, Contacts and Calendars between Webmail and your iPhone or Android device. So, add a Contact on your mobile device and it appears in Webmail. Edit a Calendar event in Webmail and the change appears on your phone. It’s like taking your Rackspace Webmail account with you – wherever you go! Email is also “push” with mobile sync, which means it’s delivered instantly – no more waiting or constantly hitting the refresh icon. Mobile sync can be added to any Rackspace mailbox for just $1 per user per month, and can be easily activated in the Admin Control Panel under Email Accounts > Mobile Sync. If you have any questions about mobile sync or its launch, please contact support or your Account Manager. We would love to hear from you. Please note this launch is for direct customers only. Mobile Sync for Rackspace Webmail will, however, be available for all customers – including resellers – in late May 2012. 1. Rackspace Webmail users will now see a Mobile Sync link in their Webmail interface explaining the benefits of the service and how to enable it. 2. Admins can then enable the mobile sync service for any mailbox in the Email & Apps Control Panel. Follow the Mobile Sync link under Rackspace Email > Email Accounts. 3. After activation, the Mobile Sync link in Webmail now provides users an “ACTIVATED” message along with self-setup instructions for their mobile device. Within minutes after setup, their accounts will begin syncing. Manny DeJesus manages our Rackspace email and webmail business. He's located in the Blacksburg, Va. office. Great job, we are looking forward to this new feature! We are hosted as Exchange and not Rackspace email, so we don’t really qualify for this, do we? I believe this synch happens automatically for us. This is similar to your sync service on Exchange, but customized for a different email platform; in this case Rackspace Webmail. This sounds like a great solution! One question, how would interaction through iCloud (synching contacts & calendar) impact this new feature from Rackspace? Gary, since this doesn’t provide sync on the desktop side, it will probably be best to stick with iCloud for contacts & calendars and use this for email only. At least it will be true push email so it is not a waste! will this be available to Cloud Sites customers, or it’s only for “Rackspace App/Email”? Cloud Sites customers will not be able to use this feature. You will need either a direct or reseller account with Email & Apps to activate the service. This sounds like a great feature, as this is using active sync could we also use this to sync with Outlook and the IPhone? Or could we use this technology to sync the IPhone to webmail, then use your sync software to sync Outlook to Webmail, that way everything is in sync? This service is strictly for syncing data between your Rackspace WEBMAIL account and your MOBILE device… not Outlook. Technically, if you’re using our Outlook sync tool (for 2007), it *should* work, but please be aware that we are early in the process of sun-setting that tool. Plans for an updated Outlook tool are undetermined. But I’ll count this post as a vote for continuing it! Thank you for your input Sean. So does this mean we can dump our Exchnage hosted emails and go with the Rackspace web for better savings? Exchange still provides a ton of collaborative features that Rackspace Email/Webmail doesn’t quite have (yet). Through our Hybrid solution (Exchange and Rackspace Email on the same domain), we strive to offer the perfect fit for all users. Hey BW, you are correct. This sync service is designed specifically for Webmail-to-mobile sync. Currently, our Rackspace Email platform does not provide full sync between mobile-outlook-webmail… which is more indicative of our Hosted Exchange offering. This feature here is ActiveSync which means it is available only for devices (phones), not desktop clients. If you need desktop sync, you’ll want to stick with the full “Exchange” account. What is essentially new here is that they are supporting device-sync via Microsoft’s “ActiveSync” technology which is supported by iOS, Android and Windows Phone. It’s perfect if you’re using the webmail interface but want e-mail/contacts/calendar on your device/phone without having to switch to a “full” Exchange account. Couldn’t have said it better myself Chris. Thank you! A significant problem with Google is their horrific use and privacy policies. The latest policy posting states, in essence, that Google can do pretty much anything they want with your information stored on their servers, including disclosing it to others. I established my Rackspace account to avoid Google. This new sync product will allow me to move from Google. They’ve already got thousands of my e-mails, but they won’t get any more! Welcome aboard Bob! And please let me know if I can help in any way. Why do you not have this available for Black Berry? Unfortunately, the demand is just not there for BlackBerry sync anymore… and it’s shrinking daily. BlackBerry doesn’t support ActiveSync. That platform can only achieve “real” sync via the Blackberry NOC which means you need some sort of actual BlackBerry server in play. Well then why not offer a solution for syncing from Outlook to the web? You used to have a product for this purpose…that you have discontinued. That is a great topic BW. And you are correct, we do have an Outlook Sync tool for 2007. Unfortunately, it’s on its way out (as is 2007). Whether or not we offer an updated Outlook Sync tool in the future is still to be determined. Thanks for your input. I will certainly count your post as a vote for Outlook Sync. I added this new Mobile Sync option to my e-mail account and configured my iPhone right away. Unfortunately, I had to deactivate Mobile Sync immediately when I discovered that my name would no longer appear as the sender of the e-mails sent from my iPhone — Only my e-mail address would appear as the sender, which does not look good for any professional correspondence. Customer service confirmed it was a known issue due to the iPhone’s limitations and unlikely to be resolved shortly. Too bad I had to give it up, it was a great concept. I am getting the same issue: just my email address is seen (my name does not appear). But in the same iPhone, I have a gmail account, configured as a Exchange Account, and my name goes fine. So, maybe it is not an iPhone limitation. Good news guys. This feature has been added and your Display Name should now show when sending email via your iPhone. Enjoy! This sounds great! Does this mean if I delete on my phone it will also delete on my laptop? Also, will the contacts from my phone be synced to contacts on webmail? And finally I use Google calendar which syncs with my phone will there be any issue with that? Let me see… Yes. Yes. and nope. I think that covers it. haha Enjoy! Nevermind I now see that it is. Very nice! The IPad/IPhone didn’t realize it for some reason and it showed up in the inbox on those devices. I had to goto my IOS settings and say turn off the mobile sync account and then turn it back on to actually have the inbox on my IOS devices reflect what was in my inbox. I just wanted to share a weird behavior. I really like the push though! Thanks for sharing your experience Ryan. I’ve noted it. Enjoy! I agree on the business calendar. It has served me well and is a smooth app and helps tie my employees and I together being on mac and PC side of the fence. I would like to put in another request for fixing Outlook 2007 sync and adding Outlook 2010 sync. That feature is the reason we moved to mailtrust/rackspace and its neglect has lead many to scoff at the “fanatical support” tagline. While Webmail solutions have closed the gap, Outlook is still by far the best mail/contacts/calender solution and it will be years and perhaps decades before people stop using Outlook. So please live up to your commitment and support it. I am having the same issue, will there be a fix, so we can update our identity to our real name??? JF, Erwin, Ron. We are actively exploring the “Display Name” feature. Definitley need the sync with outlook please as a priority. Most people need their desktops (outlook) to sync with web mail and their ipads/iphones. can you let us know when an eta for this might be available? Although we’re not sure if/when this could be available for Rackspace Email, remember full-sync with Outlook is currently available with our Hosted Exchange product. As a small business owner, I don’t know what we would do without Rackspace. Thanks so much for this feature. It makes our operations from the US to Central Asia seamless! Trying to setup rackspace webmail but still not success. Thanks Mac, glad we could help! Put me down for a vote for Outlook 2010 sync. Using the Outlook Sync / Mobile Sync combo would be the only option a lot of our clients could afford with the hosted Exchange option out of their range. Hey Jan- unfortunately, we have no current plans to support BlackBerry with this sync. I understand, however, that there are some 3rd parties out there that may be able to help. Hi Manny, for the mobilesync for iphone i understand that “display name” has been fixed but where does this get configured? Your display name will automatically be pulled from the Display Name you use in Webmail. So you don’t have to do anything on your (or the phone’s) end. Let me know if this makes sense and if it worked out for you. Hi Manny, thanks for the quick response. But I it fails every time, and I only can check it via apps.rackspace.com! Has there been any changes to the server? Can I still use the webmail.mycompany.com to check my emails? I am just starting out with Mobile Sync and cant figure out why email that is read or deleted on the iPhone is not synced as read deleted on Rackspace. I thought the whole point was to sync both ways. Neither of these experiences is typical. It sounds like something may have went wrong during setup. Can you guys contact our support team (number above) – Im confident they can get you on the right path. In regards to the Black Berry question. Is this OWA or not, as OWA for mail apparantly is supported on a BB. I am only looking for a two way sync between BB and rackspace mail. Been testing this with my wifes iPhone and thus far I’m fairly happy with the new service. Her cell phone doesn’t work in the office so she relies on Webmail to update her calendar and do email. We are still using Sync-for-Outlook but its crude at best for an application as it doesn’t handle all calendar reminders as it should. 1) Notes, a lot of users heavily rely on Notes and it would a nice implementation to have Notes sync as well. 2) A better way to sync Outlook with Rackspace Webmail. This would also have to include Notes. Maybe a network service that runs independently that ties into Outlook. 1. I successfully synced my Rackspace email account with my Android phone, but there seems to be one hiccup. When I add events to my Rackspace calendar they appear on my phone calendar, but when I add an event with my phone, it doesn’t appear on my Rackspace calendar on my laptop. I’ll definitely check out the Business Calendar for Android that someone mentioned earlier. 2. I feel really dumb asking this one – how do I compose email in the mobile app? I can reply to email, but i haven’t figured out how to compose an email from scratch. I set up up mobile sync on my Android and it works just fine. However, one big problem we’re facing is, when my office Outlook receives my emails, emails are left on the server, my phone still fetches the emails but marks them as read and no new email notifications. Instead I want the emails mark as read when I actually read/mark those emails. Is this a limitation of Android sync tool, or Rackspace mobile sync? Battal – someone from support should be reaching out to you soon. Is it possible to set up an iPhone to use Mobile Sync for just calendars and contacts, thus leaving the regular Mail app to handle e-mails? Also, can I do that on a desktop machine? Hey Vinny- I sent you an email. Mobile Sync is a great product. Off-topic question, just wondering if there will be an update to the webmail interface anytime in the future? Hey Jeff- glad you’re enjoying Mobile Sync for Rack Webmail. Regarding the interface, we’re def planning on some nice updates, coming later this year and early next. Hope this helps. I love Mobile Sync. My wonderful Windows phone and my Android tablet and my pc all happily talk to each other. Thank you. Glad to hear it Fairan. Sync on! We’re a long-term Rackspace client, we also use Google. Rackspace does have incredible tech support, but I’ve never needed tech support from Google. My current issue is what does one get from using Rackspace Mobile Sync for a fee that isn’t available for FREE on Google? Our needs are not so sophisticated that we need both Rackspace and Google, but my entire Google useage, including using our domain names is free, and everything at Rackspace costs money. We’ve found that there are a ton of businesses out there who need support with their email and other hosted IT. For those guys, it seems, having Fanatical Rackers just a phone call away is extremely valuable. Also, and in this particular case, Rackspace Webmail, even with mobile sync, is actually considerably less than Gmail for Business ($2/$3 vs $4.16 per month), so we do feel that we’re priced very competitively. I truly hope this provides some insight. Please feel free to email me at anytime if you’d like to talk some more about this. Put in my vote for Outlook 2010 Sync!!! Google has it, we want it for rackspace. Good job keeping up with all of these questions. Its September now. By my review of this thread it was May 1 when the first person asked about Outlook syncing to webmail to iPhone. Have you guys made a decision on that? I’m trying to make some config decisions and would really like to have that info on my laptop’s Outlook as well as in the cloud. Thanks! I’m not sure if I need this, maybe you could explain. I’m using Outlook 2010 on my laptop that is configured through pop3 to my Rackspace email account. My iPhone mail is also configured, as pop3 I guess, to Rackspace. 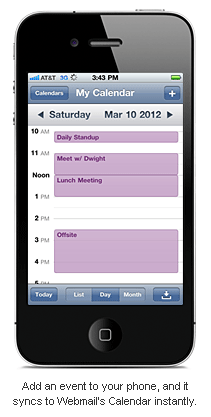 Contacts and Calendars from Outlook are synced to the iPhone through iTunes. My Outlook Calendar and Contacts are not synced with Rackspace webmail. One question would be, if I use Rackspace mobile sync for my iPhone Calendar and Contacts that then my Rackspace Webmail contacts and calendar would also be in sync with my Oulook laptop which is synced to the iPhone thru iTunes. Please, please develop an outlook 2010 calendar sync.!!! We need a calendar that will sync with all shared calendars in our domain. Mobile sync is a one way push from the rackspace site but dose not let you add information from a mobile device. This is useless for shared scheduling in the field. We need a calendar that will sync both ways and with all, in our domain. Please Help! Hey Jody – shoot me an email, I want to make sure that we dont already have something that can help you. If we dont we’ll surely take this as a feature request. I just set up my Android with Mobile Sync… My mailbox at Rackspace has many email aliases and domain aliases associated with the same mailbox. I don’t see any where to set up email identities. Where do I set up multiple email identities or personalities? I only have one login to the mailbox, so can’t figure out how to set up additional email addresses. Thanks for being the “Sync Champion”. This sounds like a true BYOD policy enforcement capability. Are these actually configurable, or is this a future plan? I wouldn’t want it to encrypt my device without my permission, etc. When I activated mobile sync, it sync to a new calendar – ‘My Exchange’ in iPhone. My outlook syncs to a different calendar with my iPhone. How can I have both rackspace and outlook sync to the same calendar on my iPhone? Sounds great, how much does it cost per month? I have a problem with an android phone (LG L9 / T-mobile) – I can get my email, but the calendar does not show up, and I can’t find a way to make it sync. This really defeats the purpose of having integrated email/calendar and if I can’t get my calendar, I will move the company to another email/calendar service.